Breckenridge has become a tradition. 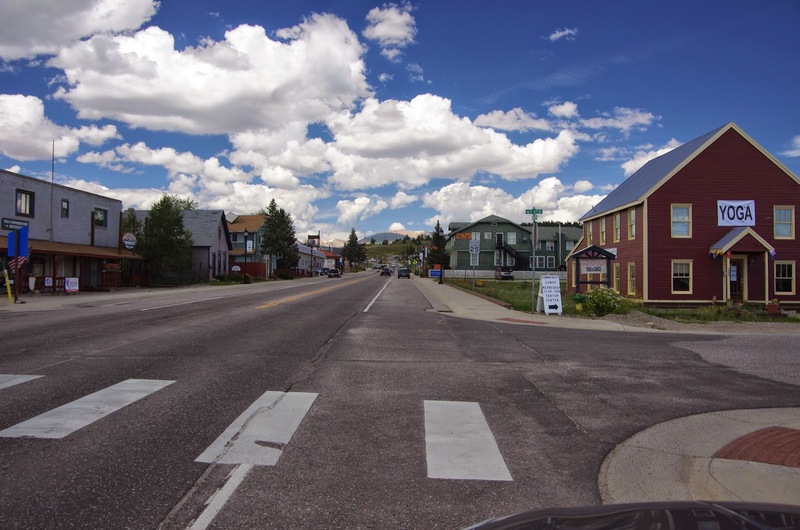 This quaint mountain town has been a featured host city for all four years of the USA Pro Challenge. It is very easy to see why, Breckenridge has beautiful mountain scenery, plentiful accommodations, an attractive and active Main Street, plenty of family activities in winter or summer, great mountain biking and cycling, plus Breckenridge has that cowboy style that sells souvenirs and looks great on television. 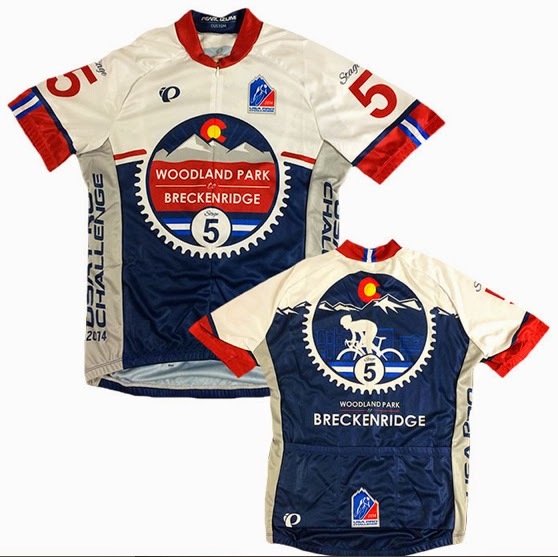 Hosting the finish of Stage 5 of the USA Pro Challenge in 2014, Breckenridge sits poised to begin an exciting weekend of racing in Summit and Eagle Counties. Friday night is the stage finish in Breckenridge and Saturday will be the individual time trial in Vail (On the path of the 2014 USA Pro Challenge - Vail). The first thing to know about Breckenridge is it is at altitude, if you sleep here you might notice it. Many people start feeling the affects of altitude at 9500+ feet. Only Crested Butte edges out Breckenridge as the highest place on this tour that you might lay your head upon a pillow. 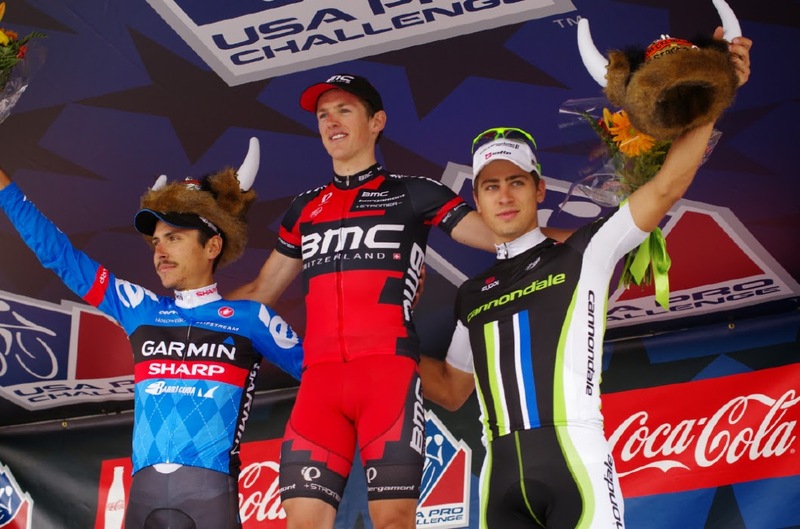 If you chased the entire USA Pro Challenge in 2014 - you would reach these heights. The second thing to know about Breckenridge is there is a lot to do in this town (or within Summit County). Mountain Biking: The Mtb Project Trails, lots and lots of trails! Climb three fourteeners: you can climb Mt Lincoln, Democrat and Bross all in the same day! Also enjoy Breck Bike Week - August 20-24, 2014. Event organizers state, "Breck Bike Week will include high-end bike demos, led group rides, trail building, lectures, clinics, free bike tunes, kids’ races and more. The bonus is that most Breck Bike Week activities are FREE and open to everyone." Schedule of Events. 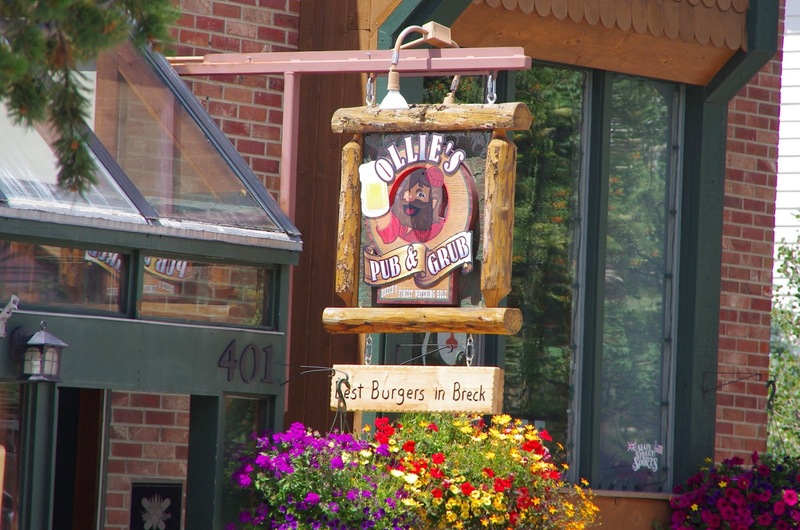 Alpine Sports will take you to Vail Pass and let you and your family ride back down. 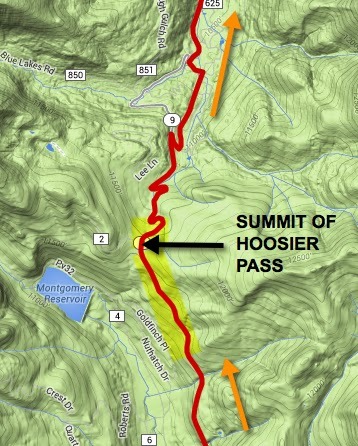 The third thing to know is that Commentator Phil Liggett pronounces Hoosier Pass - Who-zee-air Pass, with a bit of a French twist. I like it, I catch myself using it, although locals pronounce it Who-zure Pass. And then there is Bore-A-us Pass (Boreas Pass). The fourth thing to know is No DOGS. I know, sad, but Breckenridge Town does not allow dogs at any events and warm temperatures will not allow you to keep your dog safely in the car. The fifth thing to know is Breckenridge is called Breck. Use the short name and you will be so local. 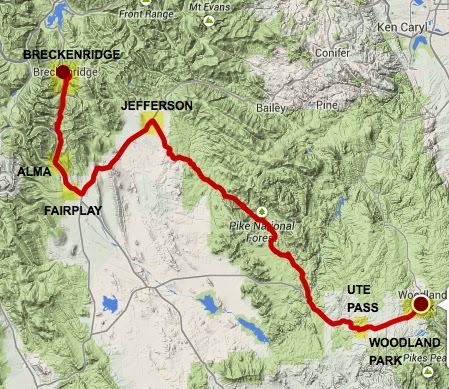 Did you know there are two Hoosier Passes in Colorado? Yes, the second one is in Teller County near Cripple Creek. This is the real one - it is in Summit County. Hoosier Pass sits on the Continental Divide, that is correct, the place where water is sorted to flow either to the Pacific or Atlantic oceans. I am sorry but the whole swirling direction of the water thing in the toilet or sink is a myth. Water exits in the same direction of its entering swirl. 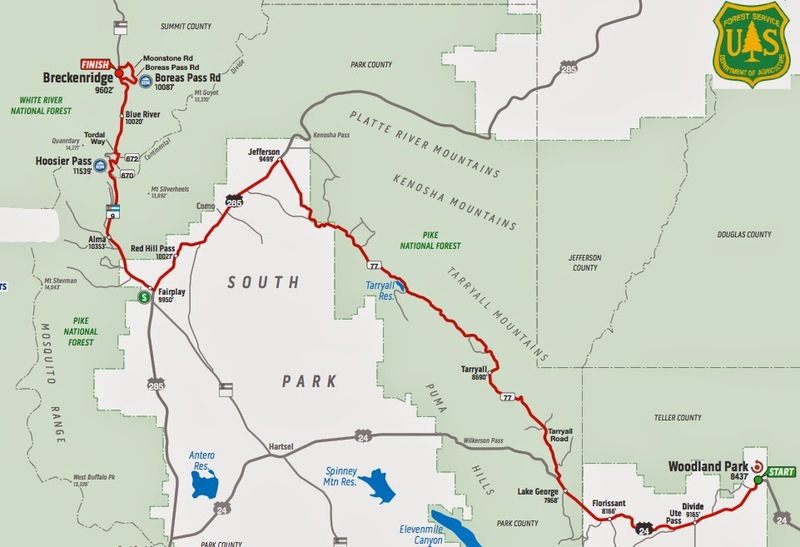 Race Begins: Approximately 11:20 a.m.
* Please note the route will go over Hoosier pass following Hwy 9 on both sides and not take the diversion onto the gravel roads on the north side of the pass. The official stage map is currently being updated. Where to see Stage 5 as a fan? Personally I would come into town early, walk through the expo area (always good in Breck) and then walk around town. 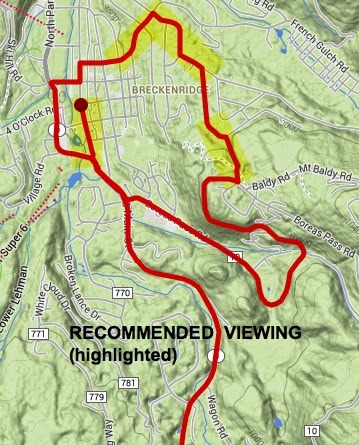 Finally I would either bike or walk up Wellington Road, Royal Tiger Dr, High Point Dr or Moonstone Road to see the racers climb. It is tough to see much in town. If you do remain in town, you can see the final sprint down Main Street to the finish line. At the south end of Main Street to the Boreas Pass corner. On Park Ave at Four O'Clock Rd, then walk through River Park to the Finish line area on Main Street. At the corners of Ski Hill Rd and Main St, then walk the blocks back to the Finish line. Bicycle Colorado is hosting bike valet locations at each stage finish expo area. They will hold your bike safely for free (if you wish you may purchase an annual membership to Bicycle Colorado as a thank you). The Bike Valet Lots are being fully sponsored by Lexus a new race sponsor for 2014. Thank Lexus. Riding your bike up to Wellington Road, Royal Tiger Dr, High Point Dr or Moonstone Road from Main St in Breckenridge on race will be easy and fun. Also if you are in Fairplay, the road to Hoosier Pass (south side) will close at 2pm, making your ride to the summit much more quiet than usual. 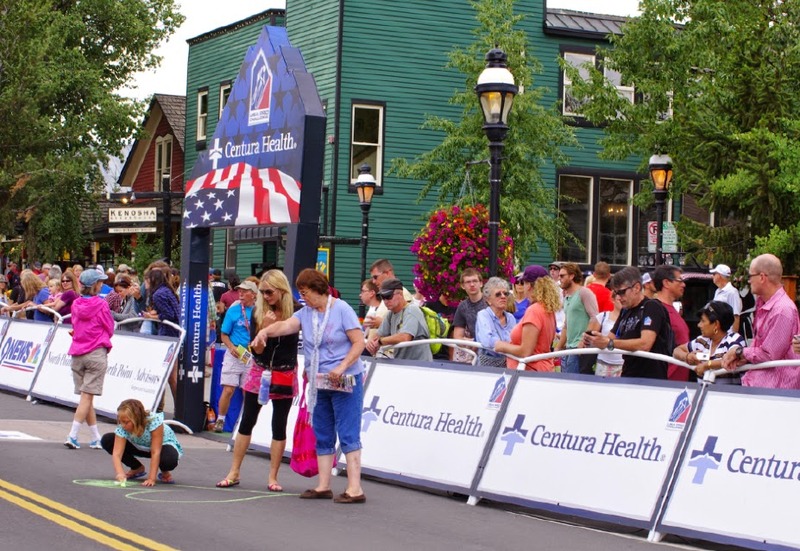 Fans wait on Main Street for the stage finish in Breckenridge in 2013. VIP tickets - VIP finish area tent in Breckenridge: $300 each, buy tickets. The VIP tent in Breck in past years has not been the best being narrow (along the street) and deep. I think the small town of Jefferson might also be a good place as the riders make a big left turn onto Hwy 285 from Tarryall Road. Likewise there will be folks gathering along the road in both Fairplay and Alma en route to Hoosier Pass, another fun place to see the placement of riders first over the summit. Remember you can track all the action while out on the road with your TourTracker app. The podium presentation is typically in the parking lot above Blue River Park about 30-minutes after the finish. Or this year they might set it up on Main St, find the podium when you arrive and plan your path to getting there after the race finish. This will be the first time Woodland Park has hosted a Stage Start. Also the first time Tarryall Road will be used in the Tour - the road was just paved last year. Riders will enjoy the wide open spaces on the long gradual climbs of Stage 5. 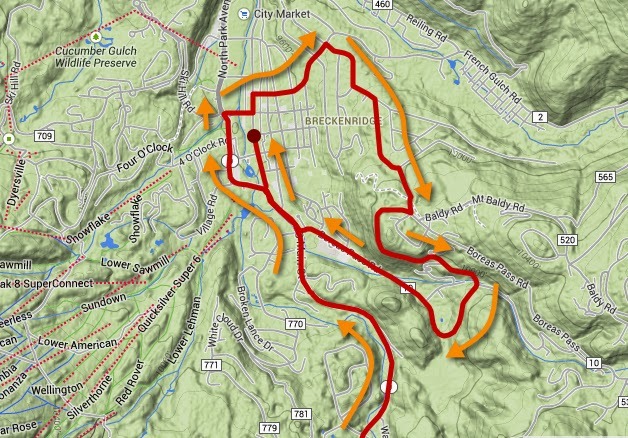 This stage will definitely have a breakaway, which makes the use of a rather long stretch of US 285 a bit of a challenge as the break and peloton will hit the highway at differing times. 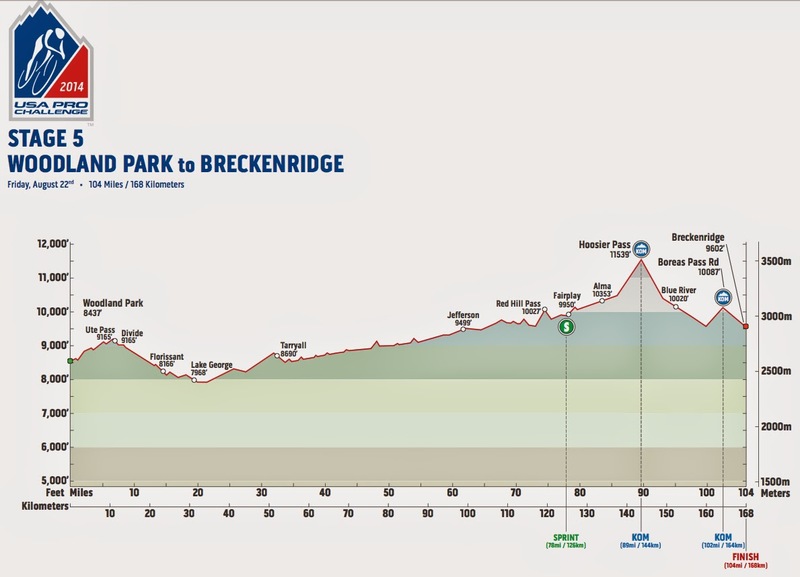 Pro riders will have no problem with the 7-8% grades of Hoosier Pass, but with the last loop climb and descent around inner Breckenridge into the finish, I would definitely expect a rider from either the break or the chase to win Stage 5. 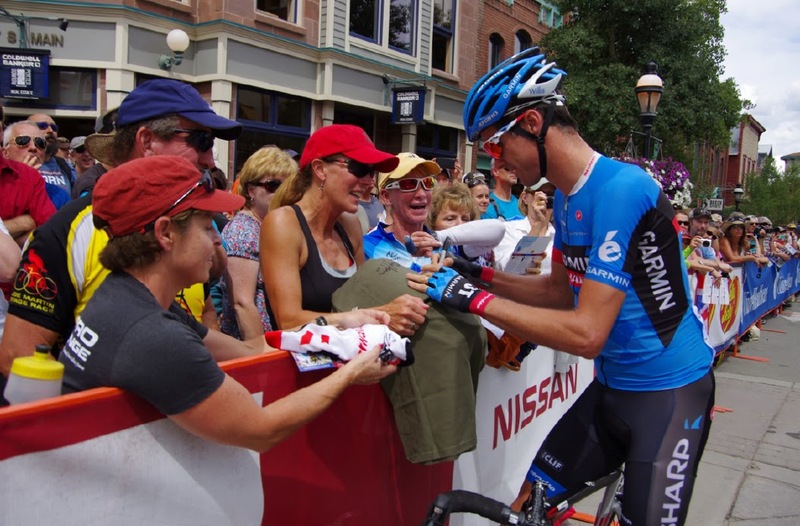 David Millar (Gramin-Sharp) signs autographs for fans in 2013 in Breckenridge. Local Breckenridge USA Pro Challenge pages: GoBreck, On Twitter: @BreckProCycling, On Facebook: facebook.com/BreckenridgeProChallenge . Use hashtag #breckbecause to upload your photos and be featured on the jumbotrom during race day. The newly paved Tarryall Rd (77) is a bit of a false flat. The town of Jefferson where Tarryall Rd meets Hwy 285. There is a post office in Jefferson. The broad street through Fairplay. Signs of mining and ranching and old architecture dot the landscape. The next town is Alma where active mining is noticeable throughout the valley. Before you know it, you are on the summit of Hoosier Pass (this sign marks the top as meters away and the switchbacks down the pass just over the summit). 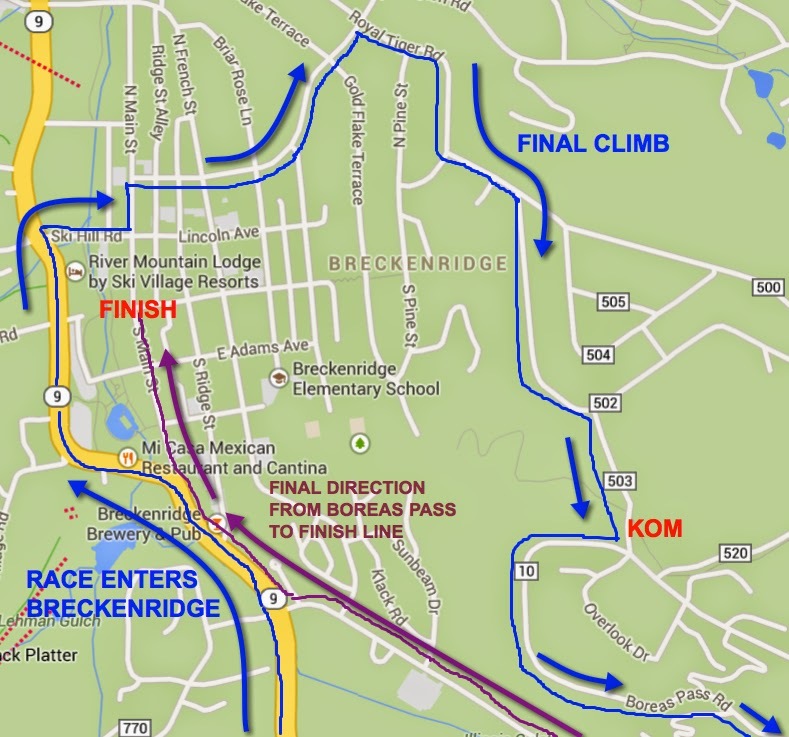 Once the riders descend into Breckenridge, they still have to climb the neighboring hills. This is the short steep Wellington Road. Finally Main Street Breckenridge and the fast sprint finish to the line. Allow extra time (+50-75 minutes) traveling to and from Denver to Breckenridge due to tunnel building near Idaho Springs. Northbound SH 9 (Hoosier Pass) from Fairplay to Breckenridge - Vehicles traveling northbound on SH 9 towards Breckenridge can expect up to a 30 minute delay. Between 2:00 p.m. and 4:00 p.m.
Southbound SH 9 (Hoosier Pass) from Breckenridge to Fairplay - SH 9 will be closed between Breckenridge and Fairplay between 2:00 p.m. and 4:00 p.m. 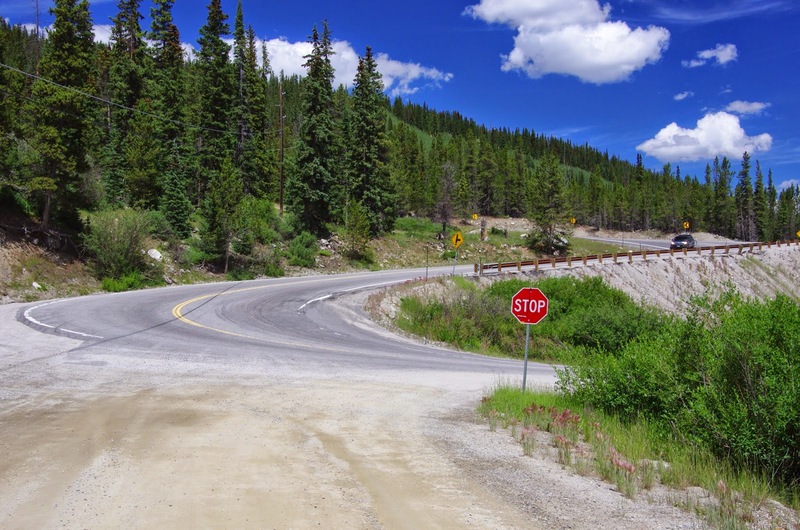 The road from Frisco into Breckenridge will not be closed. If you are visiting for the day on Friday, the city of Breckenridge advises, "The most convenient parking will be at the Satellite Lot to the north of town off of Highway 9 and Airport Road; there will be dedicated shuttles to bring you to the action. Also, those who park in the Satellite Lot will receive a free cowbell. Additional parking can also be found at: Gold Rush, Ice Rink, Klack Placer, Upper and Lower Exchange lots, Tonopah, Sawmill/Wellington, Court House, French St."
Free music on Friday evenings at the Island Grill at Friso Marina in Frisco. Free concert on Friday, August 22, 7:30pm - Big Head Todd and the Monsters, free concert at River Walk in Breckenridge. Recommended road rides near Vail, Colorado Pedal Dancer Recommended Road Bike Rides near Breckenridge (in Summit County please adapt the rides starting from Breckenridge). The ride over Hoosier Pass is not a recommended ride (on usual days). The narrow space for bikes and high traffic are not ideal except when participating in a large event ride. I would pedal from Breckenridge over Swan Mountain to Keystone and either (or both) the town of Montezuma or up Loveland Pass. 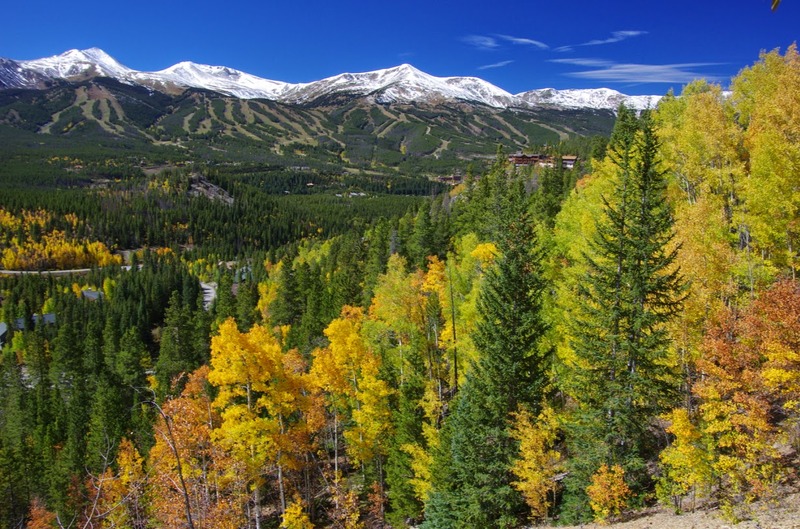 Or ride from Breckenridge through Frisco and Copper Mountain to the top of Vail Pass, descending into Vail if you want more miles and to tour Vail Village, and then return. Giampietros Italian, 100 N Main St.
Blue Moose Breakfast and lunch, 540 S Main St.
Now after all this fun, I should say - I used to live in Breckenridge for two years. I was one of very few who returned to the big city. I do not miss wearing a down coat for six months of the year, I do miss the beauty.